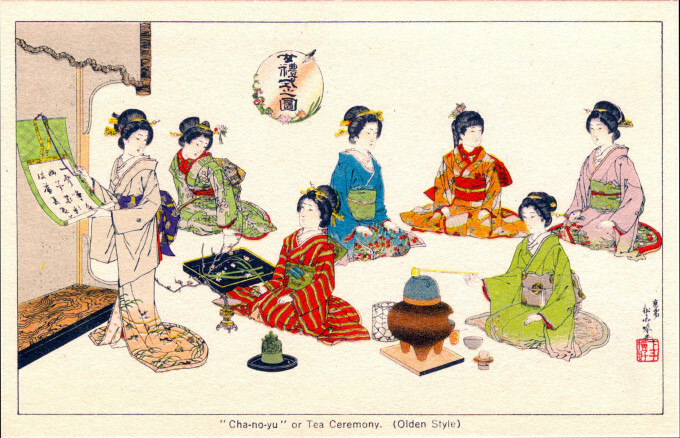 Reproduction of a woodblock print depicting the “cha-no-yu” (green tea ceremony), included in a packet promoting the Japan Tea Company c. 1950. “Tea drinking hardly would seem to come under the head of a sport or to appeal to a man who led a fast fierce life. But Sendai spent enough at it to make a dozen experts in its ceremonies independent for life. “Of this pastime Professor Chamberlain says the Art of drinking tea has gone through three stages: medico-religious, luxurious, and aesthetic. It was the third stage that appealed to Sendai. “The ceremony originated in a worthy cause. A priest named Eisai who wished to reform a youthful Shogun who drank too much sake and sham shiu, got him interested in tea by elaborating a set of rules for drinking it. When the ceremony was well established in the august favor the old priest gave the Shogun tracts on the beneficial effects of tea how it regulated the whole system and drove out devils – might indeed be preferred to the gold cure. “Eisai worked in a good deal of religion along with his tea but the ceremony of drinking grew more and more worldly until it was all luxury and no religion. Even in such extravagant observance however tea drinking was not altogether an evil. “While it lasted it gave great stimulus to art. Some of the finest specimens of native work date from the tea period. So Sendai may be said to have done good in a negative way – not meaning to, perhaps, but those of us who care for Japanese art may say ‘Thank you’ to him and his class, and drink his health from one of the famous bowls of the tea period. 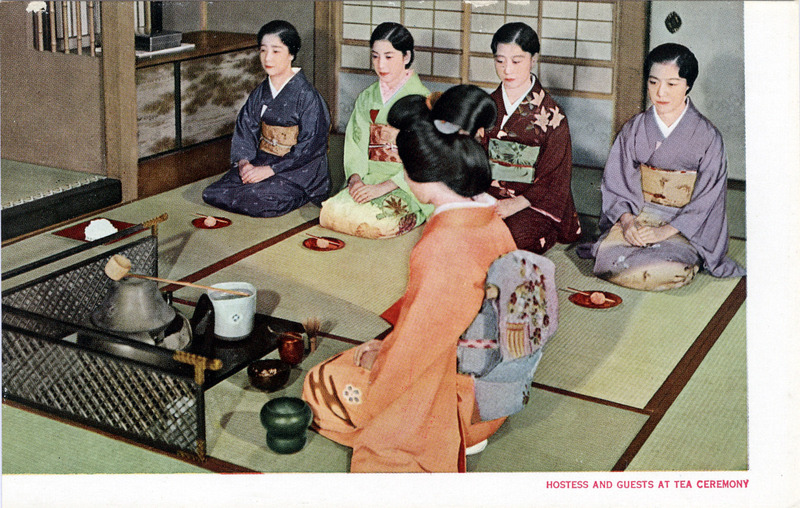 Japanese tea ceremony (chanoyu), c. 1960. Zen Buddhism was a primary influence in its development, but chanoyu would evolve into an elaborate and refined ceremony meant to demonstrate respect through grace and good etiquette. 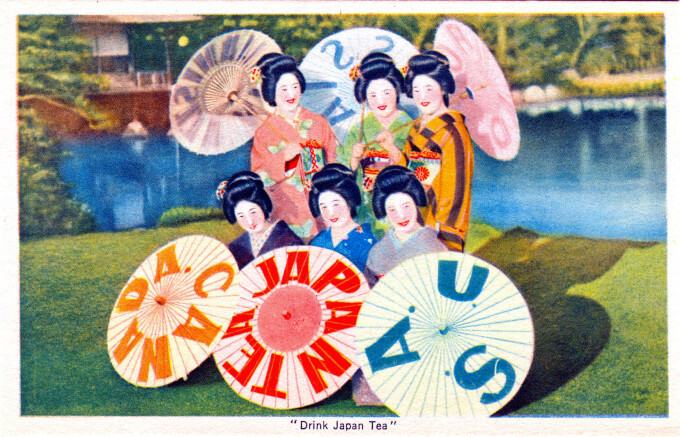 “The term ‘Cha-no-yu‘ is not, as may be imagined, a translation of the words ‘Tea Ceremony,’ but means literally ‘Hot water tea,’ or as it would read in French more elegantly ‘Thé a l’eau chaude‘ … There seems to be very little doubt that the drinking of tea, which commenced with the priests and religious orders, gradually developed into an excuse for a congenial gathering of friends and retainers, some times for political purposes, sometimes for learned or religious discourse, and later on with a more ethetic object. “Drink Japan Tea”, c. 1950, from a packet promoting the Japan Tea Company.